Barbecue is an American classic, and there are so many different ways to prepare and enjoy it. If the dad in your household is a barbecue fan, Father's Day is the perfect occasion to try out a new recipe. This time, though, give Dad a break from grilling duty. These recipes are sure to please, though, of course, you might also consider some beef tri-tip, prime rib or seafood. Whatever you choose, make it something special. Coffee is a great seasoning and works beautifully in marinades. 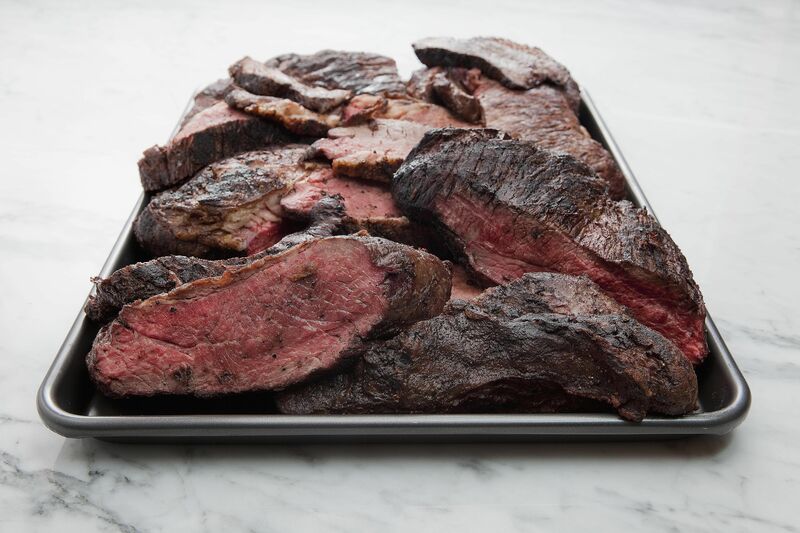 The flavor isn't overbearing and will help to enhance the natural beefiness of any steak or roast, though it's best with beef or pork tri-tip cuts of meat like this grilled espresso tri-tip roast. This cowboy steak is a fantastic way to add a southwestern flare to a porterhouse steak. With a quick sear on the grill,​ the chipotle paste is locked in, making this dish very flavorful. Start with a great spice rub for this beer can chicken. Then add the beer of your choice and enjoy the flavor as it's steamed in. If Dad is a real beer connoisseur, consider ​​choosing a craft beer such as a porter for rich flavors or a fruity wheat beer for a lighter main dish. You will want to have your grill as hot as you can get it for this blackened red snapper recipe. The idea is to get the seasonings to blacken before you flip the red snapper—then serve it up with lemon-butter sauce and a side of fresh grilled veggies. What is the buzz about these "to die for" burgers? Start by mixing chopped garlic and onion right into the burger patty, then top a perfectly grilled burger with spicy red peppers, red onion, and cool avocado. This burger is loaded with flavor and perfect for cookouts and special occasions. 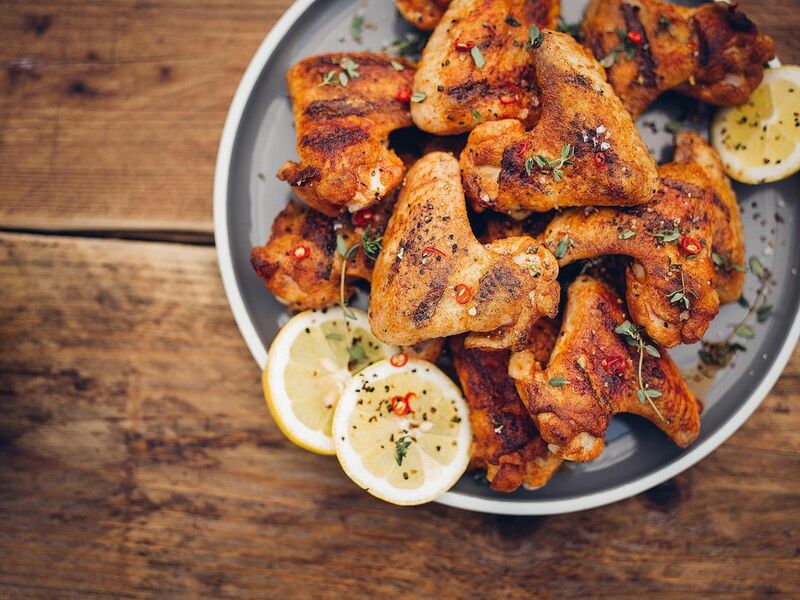 These grilled hot wings are marinated in a sweet, flavorful mixture that keeps the chicken moist and gives it an incredible flavor. Heat is provided by a habanero chili that requires care when dicing. The beer brine helps to flavor and tenderize these pork chops. You'll be surprised at just how delicious and tender these beer brined pork chops turn out. Try experimenting with Dad's favorite craft beer as a special surprise. This great rotisserie chicken recipe is hugely popular along the East Coast of the United States. Known as super chicken, el pollo rico, or Peruvian roasted chicken, this is a tasty way to make a bird with enough flavor to satisfy anyone, but mild enough for everyone. This is a great way to prepare bacon wrapped asparagus on the grill. This easy skewered bacon wrapped asparagus with chipotle blue cheese sauce is made with just a few ingredients. Perfect as a side dish, and a great crowd pleaser, it's easy to overcook—so keep a close eye on it to avoid burning. This simple and delicious basil butter smothered lobster tails recipe is a classic. The lobster is bathed in a basil butter sauce and grilled hot and fast. So much tastier than boiling, and a great way to mix it up at the Father's Day barbecue. This simple barbecued beef short ribs recipe starts out in a Dutch Oven and ends up on your grill. While you won't get a lot of authentic smoke flavor you will certainly get some great, tender ribs. This is a classic prime rib roast recipe cooked on the grill. The secret is to keep the temperature low enough during cooking and to remove it from the grill when done. Be sure to grill indirectly and also use a drip pan to catch the drippings.